The Dufferin County Museum & Archives strives to collect, preserve, and interpret the history of Dufferin County. Opened to the public in October, 1994, the DCMA is unique among Canadian community museums. Built in the style of an Ontario bank barn, the museum's striking architecture reflects the agricultural heritage of this central Ontario region. If you haven’t heard already Mulmur created the BEST small community farmers’ market in Ontario, at the Dufferin County Museum and Archives (Hwy 89 and Airport Road)! The market begins 20 May and runs from 12 – 4 pm on Sunday afternoons through 07 Oct 2018. You can shop for fresh local in-season berries and vegetables, lamb, pork, beef, veal, and chicken. There are also crafters and artisan bakers. Earl Rowe Lake provides canoeing, swimming and fishing. Camping for everyone: group campsites, radio free sites, RV and car camping. Large outdoor swimming pool open from July 1 to Labour Day. Great hiking trails including one paved trail for accessibility. 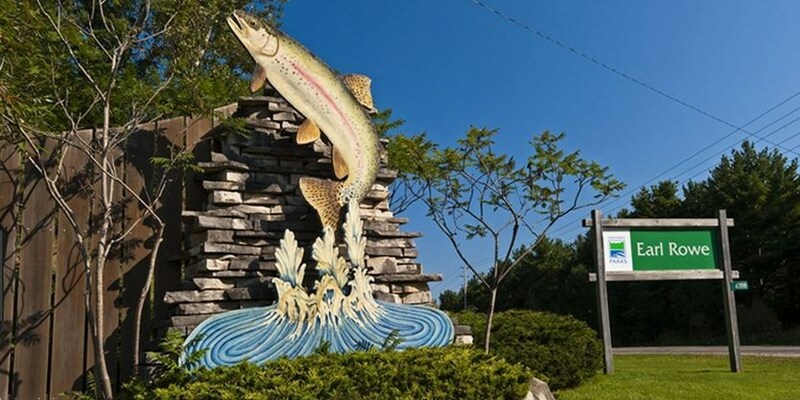 The fish ladder is a great place to view salmon spawning in the fall and trout in the spring.